I had seen a prior attempt to measure local skeptic groups, ironically conducted by a parapsychologist George P. Hansen as part of a paper very critical of CSICOP. He simply counted the local groups listed in issues of Skeptical Inquirer from 1983 to about 1990, and displayed them on a graph (Figure 2 in the paper). It showed a steady growth through that period, leveling off around 1991. But that paper was published in 1992, over 20 years ago. Much has happened since then. Where could we get more up-to-date information online? Many local groups (skeptic and otherwise) use a site called Meetup to organize their meetings. Founded in 2002, Meetup provides a simple way to list local gatherings around a theme, allows users to express their interests and sign up for the gatherings, and so on. The site can collect ticket money, send out reminder emails and more. Had enough of astrologers, psychics, homeopaths, and spirit channelers? Yearning to talk with someone rational for awhile? Meetup with other local skeptics for some refreshing and sane conversation. This is just the ticket. And because group organizers must pay Meetup a fee to continue their listings, defunct groups are culled from this list fairly regularly. That’s important, as local groups do come and go, so most lists compiled manually would naturally accrue defunct listings. But how to get historical information for these figures? I could just start now and gather them periodically, but it would take time to see any results. What I need is a way to see what these stats looked like in the past. Aha, there’s a tool for that. The Internet Wayback Machine (part of the Internet Archive) allows you to see cached copies of web pages as they looked in years past. (I’ve written about using the Wayback Machine as a skeptic tool before). 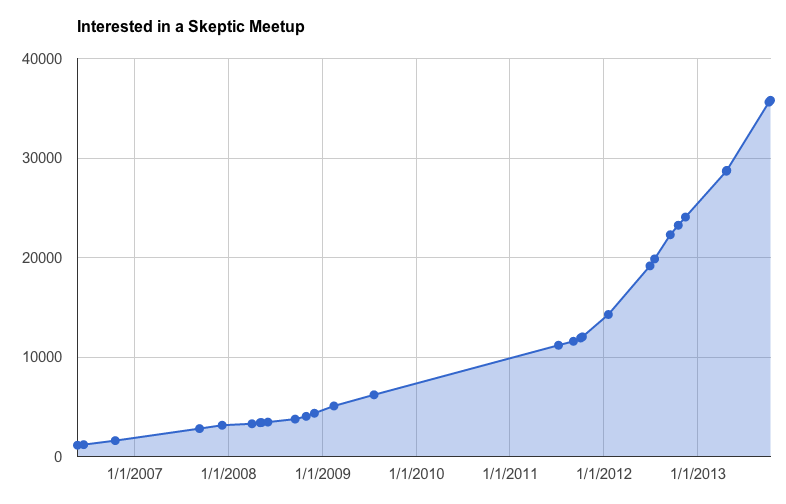 Sure enough, a check shows the archive has many versions of skeptics.meetup.com cached. I searched for all of the past versions cached by the Internet Archive. Out of 132 cached copies, only 22 versions of this web page included the statistics – they dated from April 2008 to present. Further exploration revealed that on earlier dates the statistics could be found at a different URL on the same site. That yielded 8 more sets of numbers going back to late 2004. I compiled all the numbers into a spreadsheet and graphed the results, which you can see below. As you can see there has been a steady growth in local skeptic groups that continues to this day, and might even be accelerating. You might be wondering – why the huge drop-off between early 2005 and mid-2006? I wondered that too. I found that Meetup.com changed its business model in April 2005, and started charging meeting organizers instead of the venues. There was a huge backlash against this change and they lost up to 95% of their local group organizers. 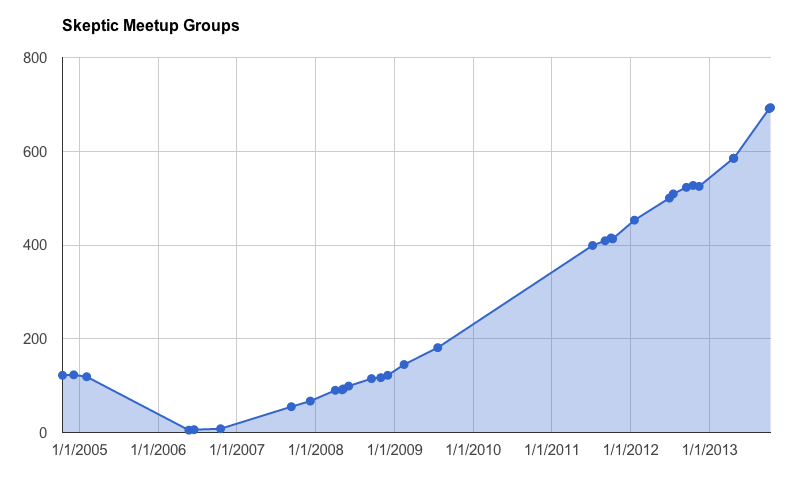 Skeptic meetups dropped from 119 in February 2005 to only 5 in May 2006 (the next available archived measurement). This seems to show an acceleration of interest in the last 2 years that is even more pronounced. The raw data for these graphs is supplied in a Google Docs spreadsheet that you can examine. Let me know if you find a new way to analyze this data. I think the growth in skeptic groups shown here is very encouraging for skepticism. However, there are some reasons to be somewhat skeptical of these numbers. For instance, how much of this growth curve simply reflects adoption of Meetup as a useful tool, and how much of it actually reflects growth in skepticism? Similarly: in its early days, Meetup was one of the few alternatives for this sort of organizing. But now other alternatives have emerged such as Eventbrite and Facebook. Facebook seems to be especially favored by groups on college campuses, and many groups that routinely issue tickets to their events lean toward Eventbrite. This might skew the results somehow. And although the caption indicates this section of Meetup is targeted at scientific skeptics, exploration on the site reveals that many of the groups listed are more oriented toward Atheism, Secularism, Humanism and so on. I even found one local ghost hunter group that is listed under skeptics.meetup.com! Those other topics are certainly of interest to skeptics, but it makes one wonder whether we are counting apples along with oranges here. I continue to research other ways to measure skepticism using online methods, and will report more results soon. Stay tuned. Sam and I started the Houston Skeptics in mid 2008, with a handful of people we knew from the JREF forum. This week, the membership (as defined by people who signed up to the meetup group) hit 990. Of course, most of those people aren’t active or never attend a meeting. But the meetings have grown to fill the rooms. Granite State Skeptics tried Meetup. It was not worth the cost at all and we got much better use out of Facebook Events. Interesting glitch I’m trying to figure out on Meetup right now. If I log out of meetup or use an incognito window and search on “skeptics” within 5 miles of Chicago, Chicago Skeptics isn’t showing up–and, yes :), dues are up to date and ‘skeptics’ is one of our tags. Do not understand this. Anyway,looking over our stats since 2009 on the meetup there have been lots of spurts, but fewer drops, mainly ‘cus I think lots of people click on it but then never bother to delete it from their list of groups. The ratio of ‘active members’ (not sure how that’s defined…visiting the group? rsvping for an event?) to ‘total members’ has much more impressive swings over the past 4 years for which I have data. This ranges from a low of about 14% to a high of about 31% with an average of 24% (we’re currently around 20%). There are so many variables in this, it’s impossible to suss out specifics (seasonal, how many event offerings per month, bringing in ‘big name folks’). But, suffice it to say, our ‘total members’ have always kept climbing even when our ‘active members’ have waxed and waned. I actually think that much of our recent ‘waning’ is occurring due to the shift to facebook, as we get a lot of independent RSVPs there. Haven’t looked over the FB stats yet. If Google Plus takes over the world, we’ll be left behind in MySpace land. Interesting stuff, thanks for posting! These stats are interesting, but I wonder what Meetup’s definition of a skeptics group is? For example, there seem to be a lot of atheist groups mentioned; yet as we know, not all atheists are skeptics and not all skeptics are athiests. I totally agree, that’s why I tried not to draw a strong conclusion. I have another post I’m working on that uses some other data sets that are more closely focused on scientific skepticism specifically that will draw a clearer picture. But I’ve got a ton of projects going and haven’t quite completely cleaned up that data yet. Stay tuned!